I first posted this tutorial 5 years ago. It was a surprise hit on my blog. I took a break from blogging and refinishing. Here is a link to the original post from 2013. There are some really interesting comments. It is still an awesome tutorial and technique. I think I should do a giveaway!!! This Tutorial is simple. 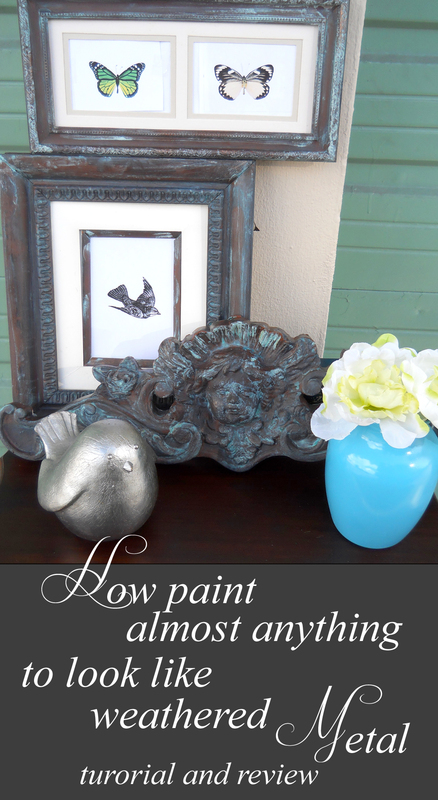 Faux mercury glass is beautiful on its own but wouldn’t it be fun to do it in any color? 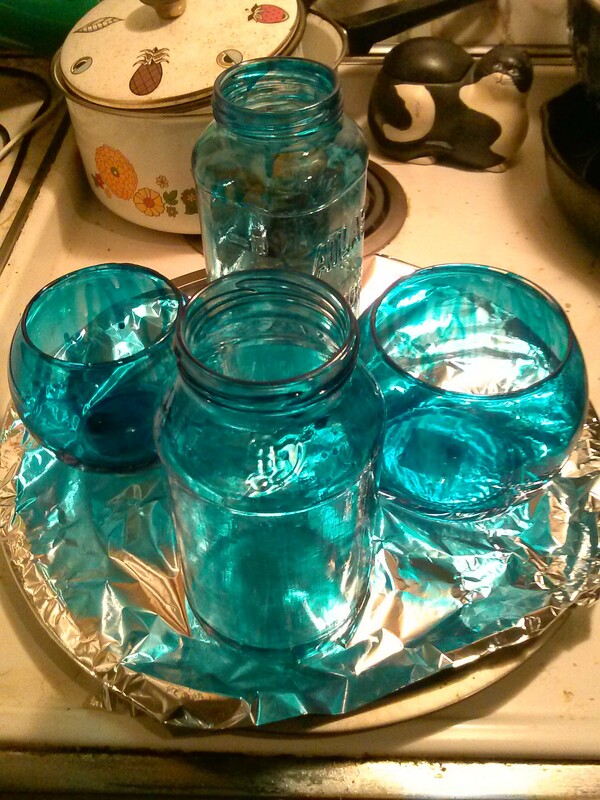 If you only want to color your glass and skip the faux mercury fun I have a colored glass tutorial here. Or If you only want to do the faux finish follow this link. 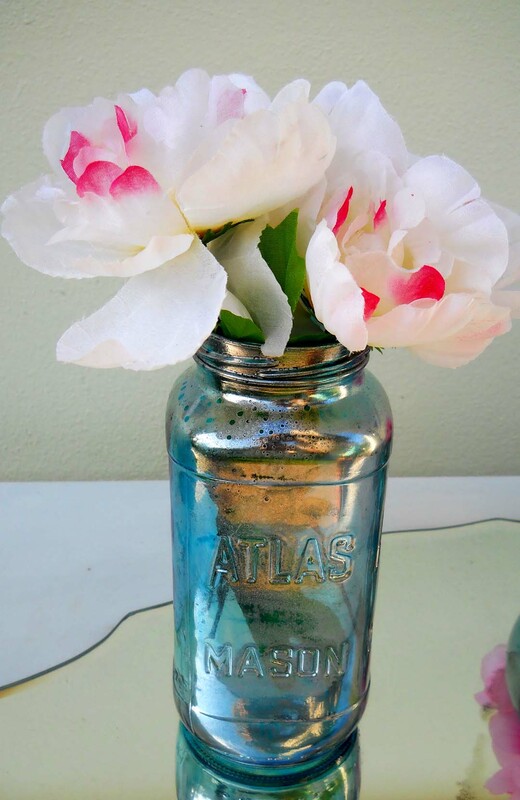 You will need some clean glass pieces you want to transform, paper towels, a spray bottle, water and vinegar, Krylon Looking glass spray (very important you need this exact paint) and … wait for it. 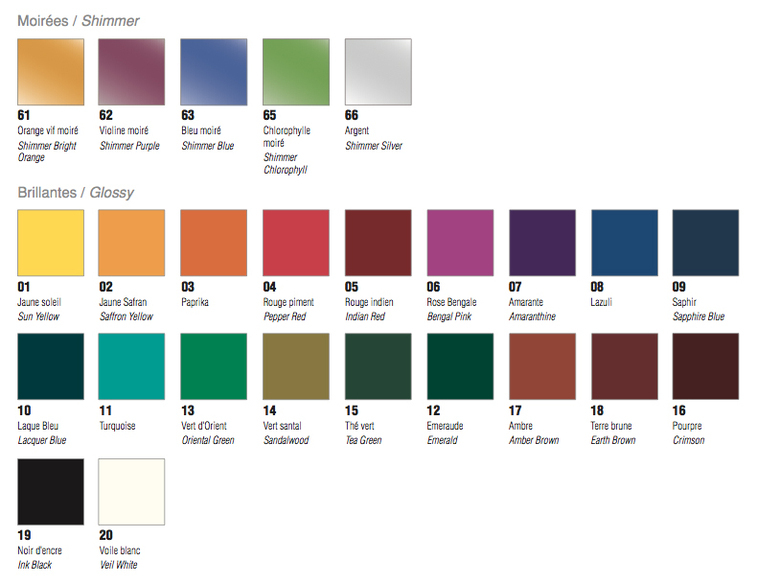 If you want colored glass get Pebeo Vitrea 160 in the color of your choice, and Pebeo Vitrea 160 thinner. Pebeo Vitrea it is a wonderful glass paint. 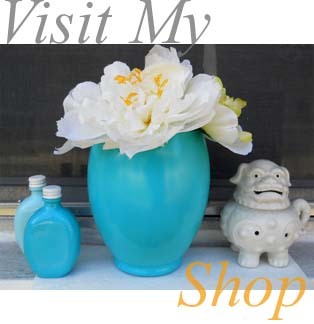 I chose turquoise, which I am madly in love with. will just use another glass paint. I tried that and I was never happy with the color. The Vitrea has an intensity that’s just can’t be beat. It is an intense color and completely transparent. I think it is worth the trouble. First, you need to color the glass. The hardest part of this is waiting for it to dry a whole 24hrs. 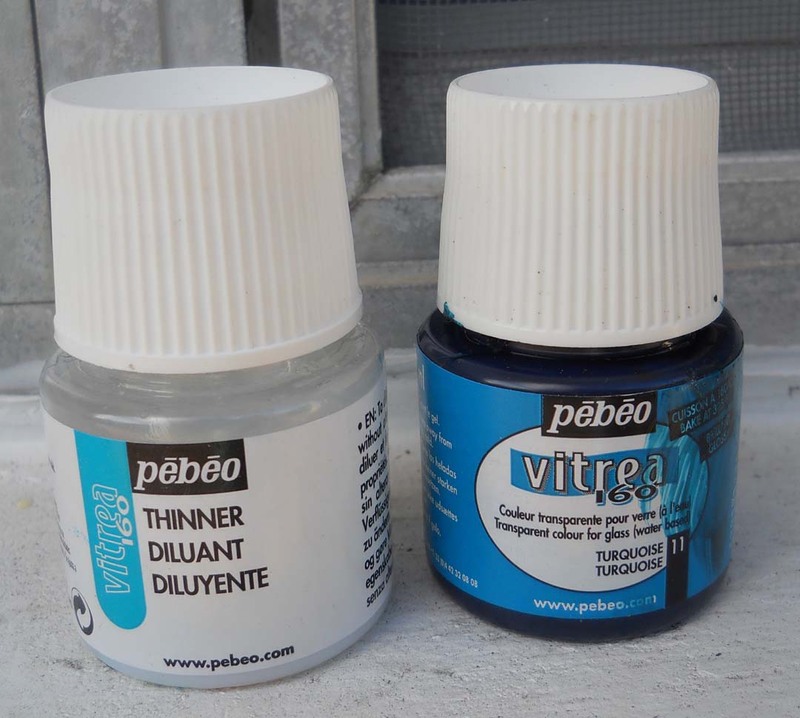 2) Mix with the Pebeo thinner and paint on your piece. I used a large brush and worked quickly. I found the best the results from painting on the outside of the piece. I tried I swirling it around on the inside with some thinner, as some others have recommended, but most of the color drained out. I had a much better result when I painted on the outside. So, go ahead, paint on the outside in a thin layer and let it dry for 24 hours. Then, if you would like it to be waterproof, bake it in your oven for 40 mins at 325. If you don’t care if it is waterproof you can skip this step. Keep in mind this paint doesn’t go on perfectly. You will probably have some streaks and unevenness in the color. To me, it doesn’t matter but just a warning for you perfectionists out there. Also, It does not have to be perfect; The color will be covered with your faux mercury finish. When you bake don’t preheat your oven, bake at 325 for 40 mins and leave the glass in the oven until it’s cool. That way, the glass doesn’t experience a big temperature change and crack. Now your glass is colored, time to get the Faux mercury look. 3) Clean your glass really well. Don’t worry about your painted surface it can handle going through a dishwasher now. Your next step is should be done outside to avoid the paint fumes. Remember, this is spray paint. 4) Your next step is should be done outside to avoid the paint fumes. You will be using spray paint. 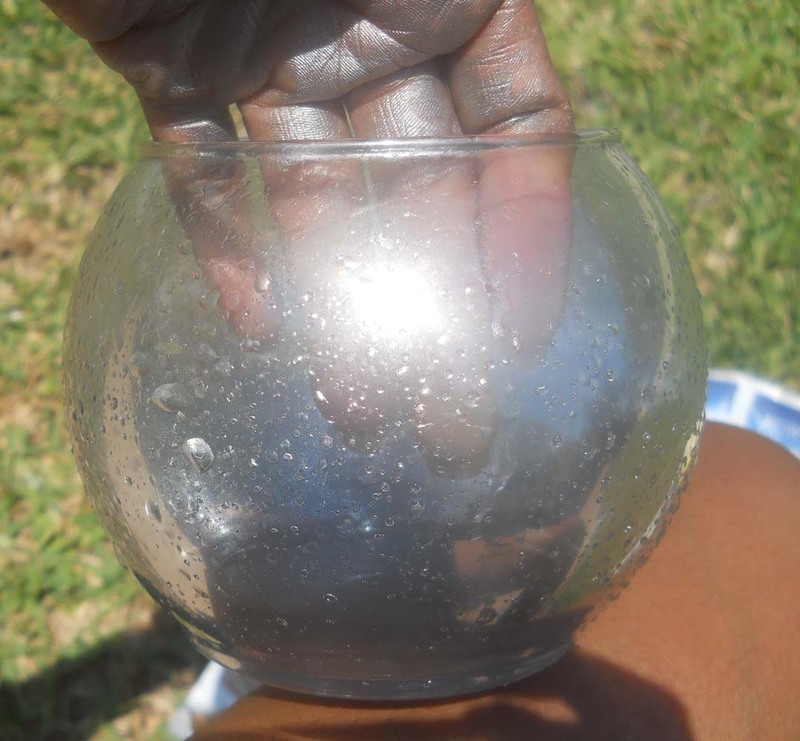 5) Mist you glass with a 50% water and vinegar solution from your spray bottle. Spray your glass piece so it has water bubbles. You might see other tutorials that say don’t let your water run on the glass. I say let it run! The running water creates more texture and I say the more texture the better. The instructions on the Krylon looking glass will say spray on the inside, trust me spray on the outside. 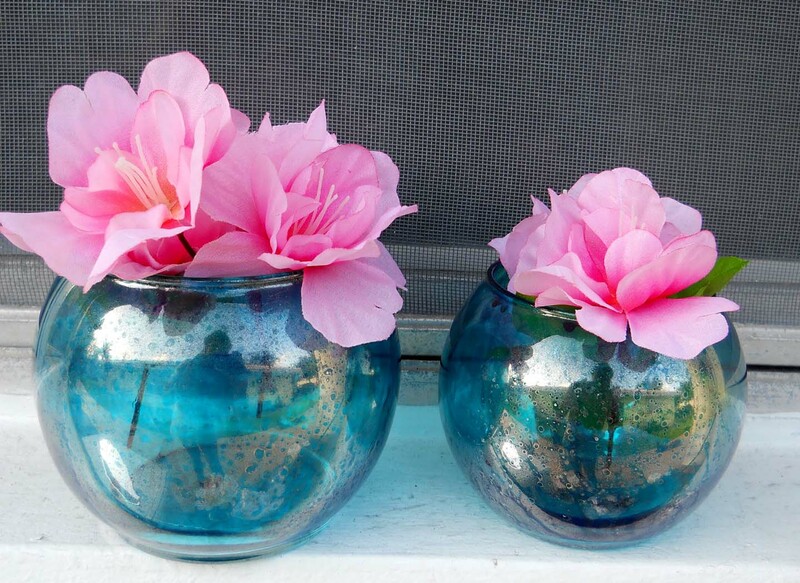 If you plan on to using it as a vase you will want to fill inside with water and if you spray it on the inside you will ruin your finish. 6) Spray the paint over your misted pieces. The liquid will prevent the paint from sticking. Leave it for a minute or two and blot with the paper towel. Then repeat until you get the look you want. You can choose to have it very transparent or add more layers to be more opaque. The outcome is gorgeous either way. So that is – mist, spray, wait, blot, and repeat till you are thrilled. It’s easy and fun. I don’t think you can make a mistake. Finally something I can’t screw up. So try it! let me know how it goes and share your results!! Until next time!